Our church has a tradition of sending care packages to college students as a way of continuing to share love with them even when they cannot be with us. Over the years I have enjoyed writing notes to kids I know, encouraging them to hang in there and that, yes, we do notice you’re not here and we care. This year, just as my kid would be on the receiving end, the project almost fell by the wayside. I stepped up to save it since I knew just how much real mail could mean to kids weathering tough transitions. Truly, any college kid. When I attended college, I got mail from my mom and my church. The church sent postcards for events I couldn’t attend because I was out of town, which felt insulting: did they not notice my address? And if they did, why not write a quick note? Or at least take me off the list? My experience fueled my desire to encourage other college students. I’ve written previously that I have never before been to the Post Office so regularly as I have been since the Big Kid started college out of state. And while I am great at writing notes, and encouraging others to write notes, or cheerleading people acting as encouragers, I stink at administering details. A few weeks ago, I went to visit my college kid. 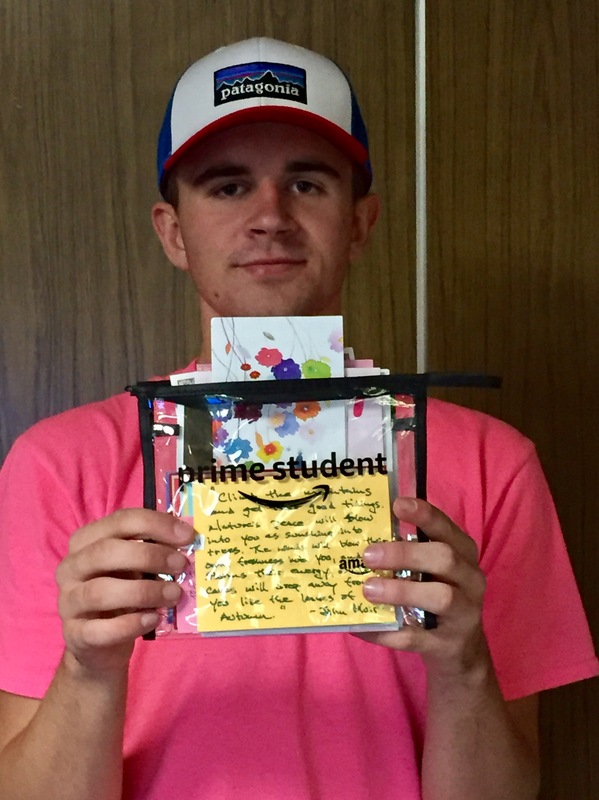 Minutes after we arrived at his dorm room he said, “Oh, Mom, I wanted to show you this…” He held up a reusable plastic envelope filled with cards. He explained, “It’s every card I’ve received since I arrived at college.” The notes from his dad and me, his grandparents, friends, church members and Scout leaders, the cards I was sure were being skimmed and recycled… No, they were being read and reread, treasured. I should mention: he didn’t know I’d taken up this project. He shared because he knew it would touch me to know how much those cards meant to him. I took his picture, better that than welling up with tears. Eventually it came together. We gathered 75 college addresses for kids who grew up in our church, or whose parents/grandparents attend our church. We collected donations of microwave popcorn and Halloween candy, and lots and lots of encouraging notes: many written to kids people knew and others written generically to kids no one knew well enough. We also collected dozens of home-baked cookies to send study break packages to small groups organized by our church’s mission partners working on college campuses—and included plenty of hand-written notes to those kids, most of whom we will never meet. 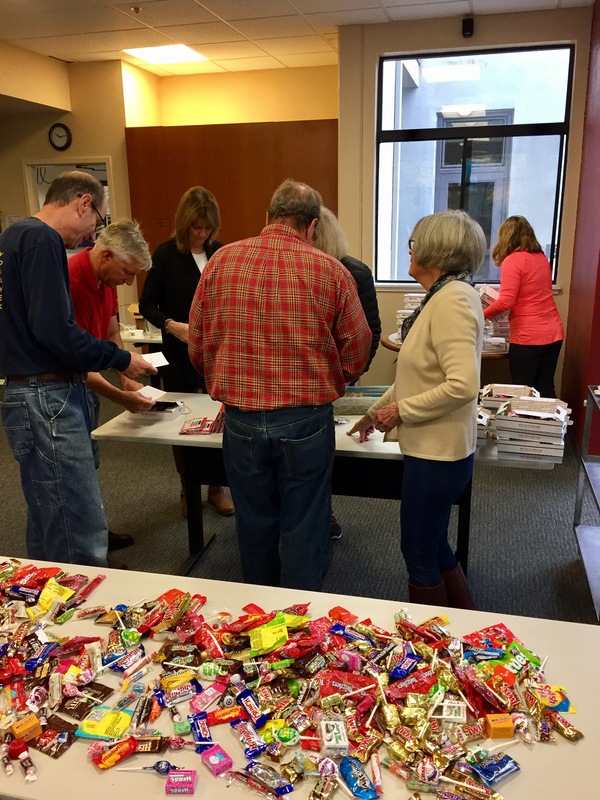 On a Saturday morning, about fifteen volunteers came together to assemble USPS flat-rate boxes, to write yet more notes, to stuff popcorn and candy and cookies into boxes. My morning had not gone according to plan (of course not, because life), and I arrived late and frazzled. Yet there they were, faithful helpers already on task loving on kids away from home. It had felt to me like details enough to drown me, yet one dear gal said, “We’re like water, settling in to our well-worn spots.” Yes. My spot is encouraging, not organizing. But I stuck it out, I told the story, and people filled in their places in a beautiful whole. When we finished in less time than we’d allotted, we gathered around the boxes to pray. And there it was: my care package. These friends and servants prayed for our kids, for strength and perseverance and guidance. They prayed for professors and mentors to come around them. They prayed for roommates and suitemates and hallmates, boyfriends and girlfriends, all of whom might wonder why a church would send care packages to college kids. They prayed God’s love and peace would shower over these precious young people. This time, I couldn’t hide my tears. I couldn’t have imagined the impact on our postal workers. It took two of us making multiple trips with arms full to carry in all the boxes: their eyes went wide. 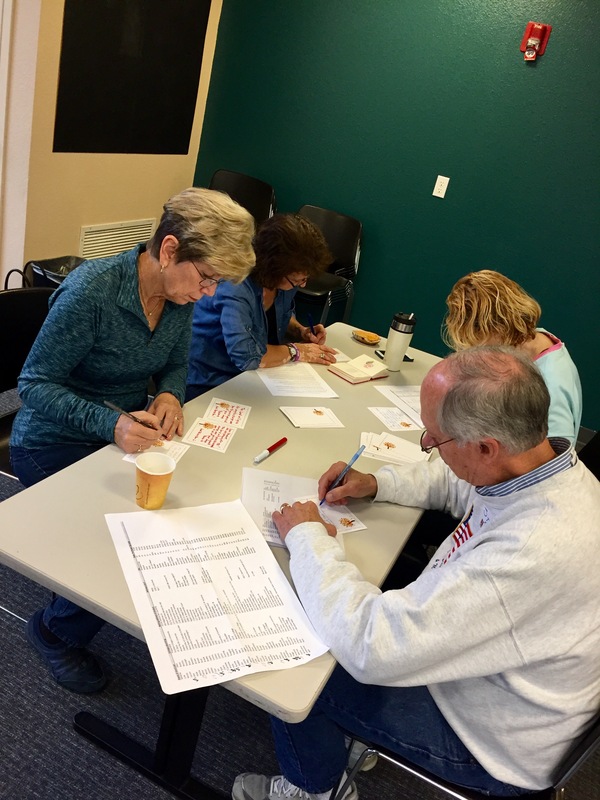 I sensed their initial shock, then overwhelm, then deep breaths as they settled into a rhythm of typing in zip codes and printing labels, restacking boxes along the way. Eventually, they began to laugh, thanking us for supporting the US Postal Service. 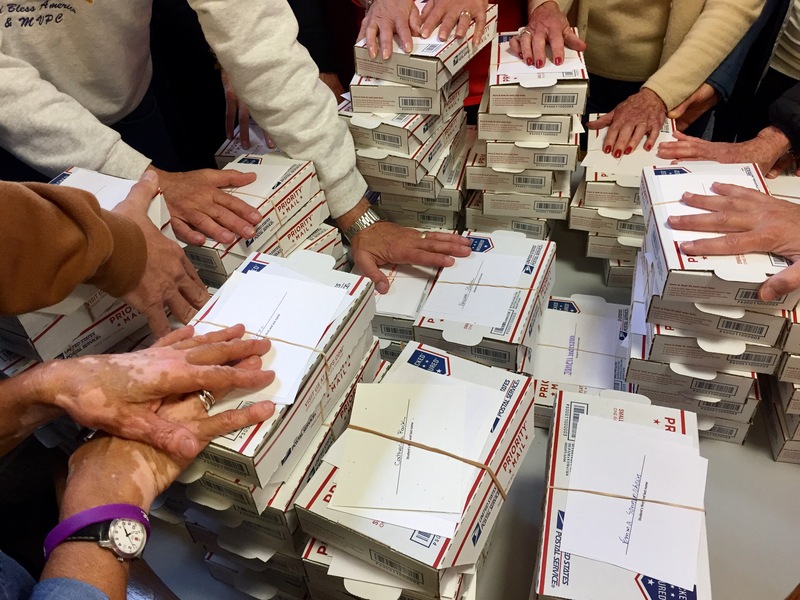 They asked what we could possibly be mailing to individuals all over the country; when we explained, they grew visibly happier to have a role to play in this big act of encouragement. When after almost an hour we were done, they were also done for the day. One postal worker declared, “Since everyone should have a little something for joy, here you go!” He reached under the counter and pulled out two Dove chocolates for Guy and me. Last night I received another care package: my kid, home for the first time, three months to the day since college move-in. Happy Thanksgiving indeed!